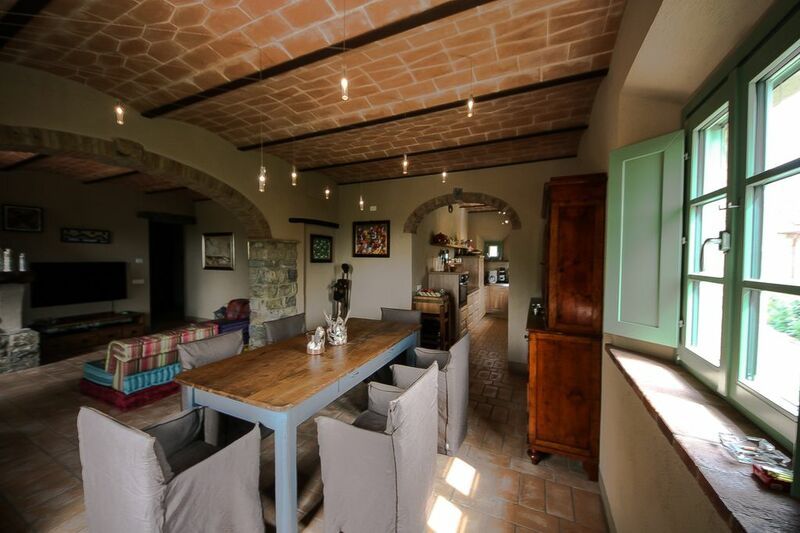 Located in the recently restored Borgo Antico of Mommialla keeping the Tuscan style also inside with terracotta floors, brick and stone arches. The apartment has a large garden and terrace equipped with table, chairs, sun beds and barbecue, where you can spend your evenings in total relaxation. From the garden you can directly access the pool with hydro-massage, enjoying an enchanting view of Volterra and the Tuscan hills. The interior consists of a living room with fireplace, dining area, fully equipped kitchen, a bathroom with shower, a double bedroom with bathroom and large shower. Furnished with fine furniture and equipped with all comforts, free wifi, air conditioning, underfloor heating, washing machine, dishwasher, electric oven, fridge and freezer. Nearby there are restaurants with typical Tuscan menu, farms where you can buy organic products. Shops and supermarkets in the villages of Gambassi Terme or San Gimignano about 10 km. We are in a central position to visit the art cities of Florence (69 km. ), Siena (62 km. ), Pisa (68 km. ), Lucca (69 km. ), Volterra (26 km. ), San Gimignano (13 km. ), Gambassi Terme (10 km. ), And in about 1h20 you can reach the Tuscan coast to spend a day at the beach. If you do not want to have traffic problems and parking, you can easily reach the cities of Florence and Siena also by train from the Certaldo station to Florence or Poggibonsi to Siena. The airports of Florence and Pisa can be reached by car in 1h20. My husband and I are passionate about sailing and this year we decided to use our boat to take day trips with lunch on board in the Tuscan archipelago, exactly in the Gulf of Baratti and on the Island of Elba with departure from the port of San Vincenzo (LI). For any information you can contact us at our phone number or by e-mail you will find on Home Away !!! .....Happy holidays from Sandra and Gianni. We have been owners of the Podere Villuzza farm for 20 years in the town of San Gimignano. Wine and oil were produced. We had a farm inside the farm with rooms and apartments. In 1994 we participated in the international wine fair in New York, winning the second prize in the full body category with the white wine Vernaccia di San Gimignano DOCG. We have had customers from all over the world as guests in the farm happy to participate in the farm life and the beautiful evenings spent dining together. In 2007 we sold the farm and in any case the pleasure of living in the countryside did not change so we bought this beautiful apartment in the ancient village of Mommialla. Looking for a flat in the countryside, this area was perfect for us, immersed in the Tuscan hills, but central to reach in a short time the cities and services. We chose this apartment because we have always been in love with the buildings in stone and bricks that make a warm and welcoming atmosphere. When we saw the interior of the apartment we fell in love with the arches and the antique wooden doors, made in old Tuscan style. From the beginning this was the perfect stay. Sandra was responsive months in advance of our visit. Arrival was a challenge because there was a driving rain storm, and to be honest the house is down dirt road. But when we arrived Sandra was waiting for us with open arms and at every turn we realized the house was so much nicer than the photos. It sits in a little village of five renovated houses, with an unobstructed view of Volterra 6 miles away across the most beautiful valley we saw on our trip. We walked the countryside from the house, and used it as a home base for exploring Tuscany. As a bonus, there was a tasty wine collection right at the house. The 7 euro red is really good, as are all the rest. At night the place is so quiet that you really feel the relaxation. The kitchen is great, as are the heated floors. We have stayed in vrbo properties all over and this stay was the best. We can rate this high enough. A must stay. Thank you very much Mason & Marsha, for your review. You have been excellent guests, I am delighted that you have spent a nice holiday in our house. The restoration of this old building has been done so sympathetically with the character of the old buildings. Just loved the under-floor heating during our week stay in March 2019, so healthy and clean and definitely a wow factor for us. But not to forget all the luxury items like the solid oak doors that fit just perfectly, the stone lintel over the lounge doorway, stainless steel worktops in the kitchen etc. In short, it’s all the personal touches that will sure last in the memory for a weeks holiday. Must also mention that this property is located between Florence and Siena so gives options for longer day trips by car or even train (we took the train), but also allows you just to relax and soak up the beautiful Tuscan countryside with stunning views. Thank you very much for your wonderful review. I am very happy to have met you and you have had a great vacation in Tuscany. You are very nice people, I really hope to see you again in the future. Many thanks for your beautiful review. We are very happy to have known you. You are very nice and we hope so much to see you again in the future. We have just spent two, absolutely perfect weeks in this wonderful accommodation and we couldn't have wished for anything better. The owners (Sandra and Gianni) have obviously put a great deal of thought into providing everything that one needs for a self-catering vacation plus the fact that these amenities are also of high quality. The location is stunning and ideal for those looking for a spot that is peaceful, has wonderful views, incredible sunsets, close to nearby medieval towns and comfortable to return to in the afternoon after a hectic day of touristic activities. Sandra and Gianni are extremely caring owners and were extremely helpful in providing local knowledge and guidance. Thank you very much for your wonderful review. We were happy to have known you. You are two wonderful peoples and we were very happy to give you information about our area. We hope so much to see you again in the future. A week in rural Tuscany in late-September. The weather was still excellent, although the water in the pool was starting to get a little cool. We still had a quick swim most days c. 18:00 however, so it wasn’t too cold! The property is beautiful, fantastic quality finish to the fixtures and fittings. It has everything you could want and more and is very comfortable. Sandra and Gianni are warm hosts with a wealth of local information. Lovely views across the hills. The location in Mummialla is perfect for us. It’s rural, hidden, quiet, more of an adults location than a kids/family place, yet close to wonderful places to visit. San Gimignano, Volterra, Certaldo Alto and more are within very easy reach. From Certaldo you can get trains to Florence and Siena easily. All in all, a great choice for a quiet break with easy travel to the towns and culture of Tuscany. Thank you very much for your review. We are very happy that you have had a nice holiday in our house. We hope to see you again in Tuscany. We loved our stay here in Tuscany at Sandra and Giannis place! The apartment is absolutely beautiful! It has everything you can possibly need and more. Out of all the places we stayed in Italy (total of 7) this place will always be our favorite. I couldn't agree more with all the other reviews the entire place is spectacular. Sandra and Gianni were the best hosts we have ever had. They had a wealth of information from recommended restaurants, maps, wineries to visit and more. We really appreciated their hospitality and all the personal touches they provided. We definitely recommend this place to stay. We hope to come back soon and do their boat tour next time! Grazie Mille Sandra and Gianni! Thank you very much for your wonderful review and thanks again for choosing our home for your holidays in Tuscany. We are very happy that you had a good time in Tuscany. We hope to see you again in the future and show you the Etruscan coast with our sail boat. A big big greeting from Italy.